235 pages, 170mm x 240mm (perfectbound), 194 illustrations including 170 colour photographs and 21 maps. Complete text in German and English. Price 24 € (approx £16). Schumannia was conceived as the German Cactus Society's equivalent of the British Society's Bradleya and America Society's Haseltonia. Schumannia 3 however further develops this title's unique aspects. It is devoted to a single subject, is bilingual and at 235 pages is considerably longer than Bradleya or Haseltonia. There have been a number of publications on Brazilian Cacti in recent years and it is fortunate that by and large they compliment one an other. This work is best described as a serious systematic review of the family cactaceae as it occurs in Brazil. While the title of the publication includes other succulents these are not treated in the same degree of detail. There is however detailed conservation information on the other succulents and also bromeliads which are another interest of the authors. Pierre Braun (who lives in Germany) and Eddie Esteves (who is Brazilian) have travelled extensively in Brazil for more than 20 years visiting many previously un-botanised areas and have been responsible for the discovery and publication of many new cacti species. The book opens with a general review of the history of the exploration of the dry areas of Brazil and the literature which has resulted. This is accompanied by a number of landscape photographs which give a good idea of the terrain and its vegetation. The area is very large so there is a wide range of different habitats. There is a short section on the succulent vegetation which is found alongside the cactaceae including some Euphorbias and Bromeliads. The Brazilian cacti are quite confusing plants taxonomically and there are a number of endemic groups eg, Uebelmannia and Discocactus whose relationships in the cactaceae are not at all clear. Some of their more unusual morphological features are discussed to speculate on their significance. The authors are both extremely concerned about the conservation status of many of the Brazilian cacti and a large section is devoted to this topic. In a few cases collection of wild plants has bought some species to the verge of extinction but the largest threat is habitat destruction for agricultural purposes. I found the picture on page 55 particularly disturbing - it shows a vast panorama consisting of a featureless ploughed plain with not a living thing in sight. Some species by nature of their habitat are much less vulnerable - the authors describe the habitat of Siccobaccatus (Austrocephalocereus] dolichospermaticus as 'a calcareous massif about 120 km long which must contain billions of plants' This must be a truly amazing area to explore. A large table gives the conservation status according to various authorities of the taxa of Brazilian cacti. The book includes a number of new name combinations and these are gathered together in an appendix for convenience, there is also a very extensive table of synonyms to help you find you way through the taxonomic maze and more than 20 pages of literature references which will be a most valuable resource. Multilingual texts are very hard to do well and I found this a bit of a problem in this publication. The large number of photographs and figures break up the text considerably to start with and I found myself hunting for the next English section and jumping around a lot in the text as a consequence. The only real solution to this is separate german and english editions but that would inevitably result in a higher price - as it is this volume is very reasonably priced considering the number of colour illustrations. 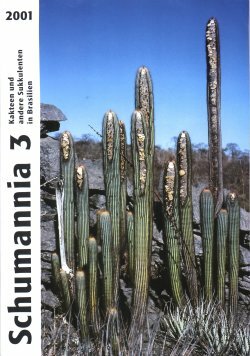 The publication of Schumannia 3 has been accompanied by the relaunch of the website The Paradise Brazilian Cacti and Bromeliads by Pierre Braun and Eddie Esteves. This stylish website is devoted to the conservation of the Flora and Fauna of Brazil and Eddie Esteves tells me it is targeted at the young people of Brazil hoping to educate them and get them involved in conservation issues. I wish them success with this aim as it is undoubtedly needed urgently. Deutsche Kakteen-Gesellschaft e.V., Bachstelzenweg 9, D-91325 Adelsdorf, Germany. Visa/MasterCard payment is available for overseas orders. Also available from: Kakteen-Haage Shop, Germany.